Wearing braces will probably never make your list of Most Pleasurable Life Experiences: you'll have to avoid certain foods and habits, endure some occasional discomfort, and perhaps feel some embarrassment about your appearance. The good news, though, is that at worst, these are mostly no more than inconveniences and additionally they're well worth the straighter, more attractive smile you'll achieve. But there's one downside to braces that can lead to something more serious. The braces hardware makes brushing and flossing more difficult—and that could increase your risk of dental disease. The principal goal of oral hygiene is to remove dental plaque, a thin film of accumulated bacteria and food particles that can cause tooth decay or periodontal (gum) disease. Without effective brushing and flossing, plaque can build up quickly and make the chances of having either of these two diseases more likely. Not only does the braces hardware hinder your toothbrush's or floss's access to the parts of the teeth it covers, but it can also create "hiding places" for plaque build-up. Several studies have found that braces wearers on average have up to two to three times the plaque build-up of non-braces wearers. There are ways, though, to make hygiene easier while wearing braces, particularly with flossing. Floss threaders or interproximal brushes can both be used to access between teeth while wearing braces. Another option is a water flosser or irrigator that sprays pressurized water between teeth (and beneath brackets and wires) to remove plaque. And braces wearers can get a prevention boost with topical fluoride applications or antibacterial mouth rinses to reduce disease-causing bacteria. Besides taking a little extra time with brushing and flossing, you can also boost your mouth's health with good nutrition choices, less sugar consumption and keeping up regular dental visits. And, you should also see your dentist promptly if you notice any signs of tooth or gum problems—the sooner you have it checked and treated, the less damage any dental disease is likely to cause. 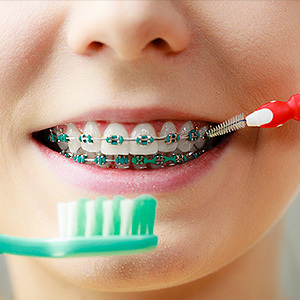 It's not easy keeping your teeth and gums plaque-free while wearing braces. But with a little extra time and effort, a few helpful tools and your dentist's support, you can maintain a healthy mouth during orthodontic treatment. What does spring mean to you? The season officially starts on March 20th, but depending where you live you might start seeing the signs earlier or later. We often think of spring as a time of new beginnings—when the first green buds appear and the earth wakes up from its winter sleep. Spring is also a great time to break out of those old winter routines and make positive changes in your life; for example, learning to manage stress, improving sleep habits and getting more exercise. To those worthy aims, we'd like to add one more suggestion: This spring, make it a goal to improve your oral hygiene! Maintaining good oral hygiene often results in fewer cavities, reduced gum disease and better checkups at the dental office. But for some people it can mean a lot more. 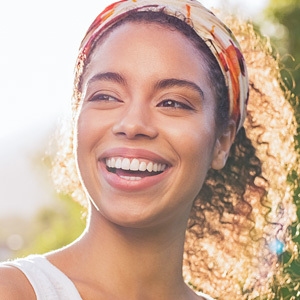 A growing body of research points to a connection between oral health and overall health—especially when it comes to systemic (whole-body) diseases such as diabetes, cardiovascular disease, rheumatoid arthritis and others. 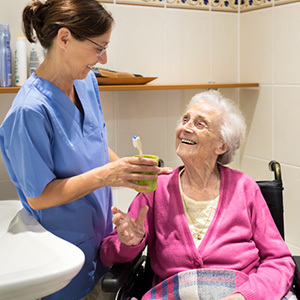 In many instances, improving oral health can lead to better management of these diseases. Brush twice a day with fluoride toothpaste, AND floss once a day—every day! Use a soft-bristled toothbrush for gentle, effective cleaning. Limit between-meal snacks to give your mouth a chance to neutralize the acids that can cause tooth decay. Stay away from sweetened and acidic drinks like soda (even diet), so-called "sports" and "energy" drinks, and other foods and beverages with a high sugar content. Drink plenty of water to increase production of healthful saliva and keep your whole body properly hydrated. Visit the dental office regularly for checkups and professional cleanings. This is essential for good oral hygiene. A professional cleaning can remove hardened plaque deposits that can't be cleaned effectively at home. A thorough dental exam can find and resolve small problems before they become big headaches (or toothaches)—and even help prevent them from happening! Practicing good oral hygiene is the best way to keep your smile healthy for your whole life. And having a bright, healthy smile is a great way to greet the new season! Basketball isn't a contact sport—right? Maybe once upon a time that was true… but today, not so much. Just ask New York Knicks point guard Dennis Smith Jr. 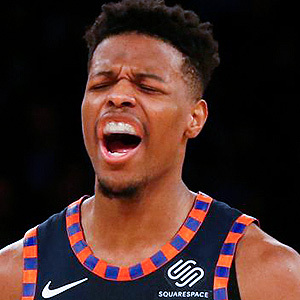 While scrambling for a loose ball in a recent game, Smith's mouth took a hit from an opposing player's elbow—and he came up missing a big part of his front tooth. It's a type of injury that has become common in this fast-paced game. Research shows that when it comes to dental damage, basketball is a leader in the field. In fact, one study published in the Journal of the American Dental Association (JADA) found that intercollegiate athletes who play basketball suffered a rate of dental injuries several times higher than those who played baseball, volleyball or track—even football! Part of the problem is the nature of the game: With ten fast-moving players competing for space on a small court, collisions are bound to occur. Yet football requires even closer and more aggressive contact. Why don't football players suffer as many orofacial (mouth and face) injuries? The answer is protective gear. While football players are generally required to wear helmets and mouth guards, hoopsters are not. And, with a few notable exceptions (like Golden State Warriors player Stephen Curry), most don't—which is an unfortunate choice. Yes, modern dentistry offers many different options for a great-looking, long lasting tooth restoration or replacement. Based on each individual's situation, it's certainly possible to restore a damaged tooth via cosmetic bonding, veneers, bridgework, crowns, or dental implants. But depending on what's needed, these treatments may involve considerable time and expense. 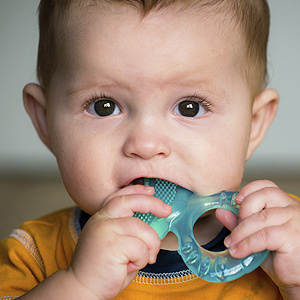 It's better to prevent dental injuries before they happen—and the best way to do that is with a custom-made mouthguard. Here at the dental office we can provide a high-quality mouthguard that's fabricated from an exact model of your mouth, so it fits perfectly. Custom-made mouthguards offer effective protection against injury and are the most comfortable to wear; that's vital, because if you don't wear a mouthguard, it's not helping. Those "off-the-rack" or "boil-and-bite" mouthguards just can't offer the same level of comfort and protection as one that's designed and made just for you. Do mouthguards really work? The same JADA study mentioned above found that when basketball players were required to wear mouthguards, the injury rate was cut by more than half! So if you (or your children) love to play basketball—or baseball—or any sport where there's a danger of orofacial injury—a custom-made mouthguard is a good investment in your smile's future.